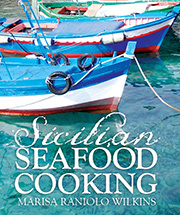 Just recently I was speaking to a group of lovers of Sicily (TSAA-The Sicilian Association Of Australia) about recipes from my book Sicilian Seafood Cooking (Reprint edition, Released date 1 Dec 2014) that are easy to cook and very suitable for festive occasions. 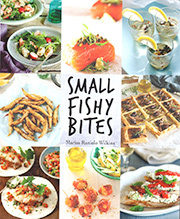 One of these recipes was Pasta con bottarga – it is special. Si vo viviri gustusu, ova di tunnu e cacocciulu spinusu (Sicilian proverb). Se volete vivere di gusto, uova di tonno e cardi spinosi (Italian translation). If you wish to live like a gastronome, eat tuna eggs and prickly cardoons. I first wrote this post in March 2009. I cooked Pasta con bottarga on Good Friday (day of abstinence). My mother, brother and sister in law visited us in Melbourne. I had bought the bottarga from Enoteca Sileno. Bottarga (from the Arab word botarikh – salted fish eggs) features strongly in Sicilian food. It is called buttarga or buttarica in Sicilian and it is the name for the cured roe sacs harvested from the females of the grey mullet (bottarga di muggine) and tuna (bottarga di tonno.) The tuna roe is the most common in Sicily and pasta with bottarga is a Sicilian specialty well worth eating on special occasions. In Sicily almost every part of the tuna is eaten, either fresh or processed – canned, salted, air dried and smoked. These days, the skills and traditions of locally processing and preserving some parts of the tuna are at risk of disappearing. Some of these processes tuna products are listed as endangered tastes in the Slow Food compendium of The Ark of Taste. Making bottarga is labour intensive. It was once made by dipping the sac in beeswax and leaving it to dry in the sun. In more recent times the roe sac is treated with sea salt, dried for up to two months and hand pressed into a solid mass. Bottarga is relatively expensive in Australia (and not cheap in Sicily) and is available in specialty food stores that specialize in Italian products. It has a distinctive flavour and is rather salty, so it is used sparingly to flavour dishes. Anchovies are used much the same way, but substituting anchovies for bottarga, would be like replacing truffles with mushrooms. Before it is grated over the pasta, the outer membrane of the roe sacs needs to be removed and then it is either grated (using the courser part of a cheese grater) or shaved very finely and soaked in extra virgin olive oil to soften before use. Bottarga is also a popular product of Sardinia where it is presented with fresh pasta made in the shape of malloreddus – gnocchetti or small gnocchi. Long pasta such as spaghetti or spaghettini or bucatini are traditionally used in Sicily. Heat the olive oil, add garlic parsley and chili and over high heat cook it until the garlic is lightly golden and the parsley has wilted. Mix the cooked pasta with the sauce. Add grated bottarga and the basil leaves, stir and serve.